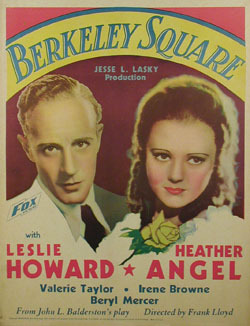 Peter Standish (Leslie Howard) inherits a house in Berkeley Square in London, and develops a fascination with his 18th century ancestors, as well as a belief that he can will himself to go back to that time. He is aware that his American ancestor of his same name visited the house 150 years ago, and he plans his time travel on the anniversary date of that event. He is successful, and arrives at the house just as his ancestors, the Pettigrews, are expecting the other Peter Standish. Initially he makes a favorable impression, but, over time, he is careless with his references to events and people in past, rather than present or future tense. The family not only begins to see him as strange but, perhaps, possessed by the devil. He and Helen Pettigrew fall in love, but she intuits the truth about Peter, and that their's is a doomed relationship. As she stares into his eyes, she experiences a vision of a montage of technological devastation and destruction in the two centuries separating them. She tells him that he must return to his life in the future, and that he should then visit her churchyard grave. Back in his present, Peter visits Helen's grave, only to learn that she died just three years after they parted. 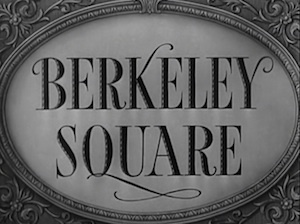 Berkeley Square was remade in 1951 as I'll Never Forget You (British title,The House in the Square). Dr. Richard Striner has graciously provided for our readers a new chapter about Berkeley Square for his book, Supernatural Romance in Film. This new chapter will appear in the revised edition of the book. In the meantime, you can download the Berkeley Square chapter in PDF format, copyright Richard Striner.